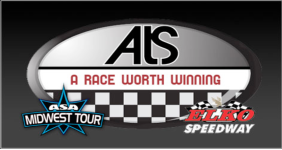 March 24, 2012 – The American Speed Association® Midwest Tour joins Elko Speedway for the 4th annual Thunderstruck 93 event on Saturday, September 22nd in honor of Dan Ryan Sr. who lost his life to ALS. This race will be 125 laps with a break at lap 93 in memory of Dan. The credibility of the ASA Midwest Tour combined with one of the most prestigious short tracks in the Midwest will bring power to an event that draws people out for a great night of racing and more importantly for a great cause. “Tom Ryan reached out to us a few years back about sanctioning this event but our schedules just couldn’t line up. With some recent changes to our 2012 schedule, it opened up an opportunity for us to find a date and make it happen. Everyone on the tour loves to race at Elko, its continually one of our best races of the year and a race that adds power to the current season schedule. To be able to be a part of such a great charity foundation (ALS) and to honor Dan Ryan is going to be special to everyone involved and we are proud to be able to bring the stars of the ASAMT to Elko twice this year,” said Steve Einhaus, ASAMT Vice President. The race is hosted by the Ryan Family in conjunction with ARWW-ALS. Thunderstruck 93 was named after one of Dan’s favorite songs and includes his nickname “Thunder” and his racing number, 93. Fans can get involved and be a part of the event by becoming a lap sponsor. Half of the sponsorship dollars will directly benefit those with ALS, while the other half goes to the driver leading that lap. Local drivers and ASA Midwest Tour competitors, Jacob Goede and Dan Fredrickson are previous winners of the event and are both looking forward to the ASAMT being a part of it. “It’s great that Thunderstruck will be part of the ASAMT schedule. This is a race the fans won’t want to miss,” said Goede. “Bringing the tough competition of the ASAMT to Thunderstruck is something that I imagine would make Dan proud,” added Fredrickson. In the past six years, A Race Worth Winning has raised over $275,000 to help Minnesotans living with ALS. The money A Race Worth Winning has raised has been donated to the Minnesota Chapter of ALS and earmarked for research and medical equipment. For information about upcoming events please visit www.aRaceWorthWinning.org. To learn more about the American Speed Association® Midwest Tour, log on to asamidwesttour.com. For questions call the ASA Midwest Tour office at (630) 212-6022 or Tim Olson at (612) 327-5831 or e-mail Tim Olson at tim@asamidwesttour.com or Steve Einhaus at steve@asamidwesttour.com. To learn more about the Daytona Beach, Florida-based Racing Speed Associates or the American Speed Association® Racing Member Track program, call (386) 258-2221 or send an e-mail to info@asa-racing.com. For news and information from racetracks and regional tours involved in the American Speed Association®, visit www.asaracing.com. The race winner takes home a custom guitar trophy. Fans can get involved by sponsoring a lap with half of their sponsorship dollars going directly to the driver leading that lap, half going to benefit those with ALS. We are thrilled that the ASA Midwest Tour will be part of that tradition in honoring the legacy of a great man.